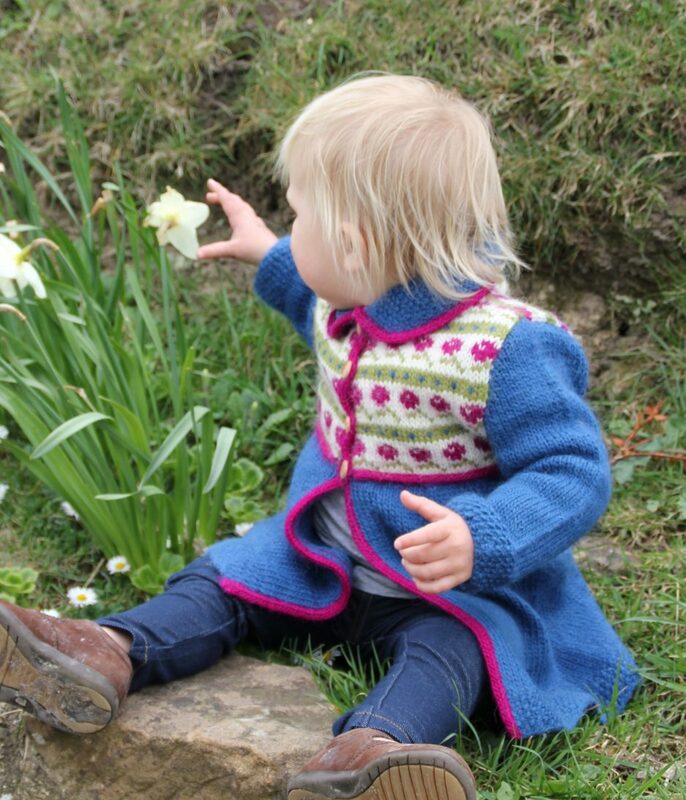 With pretty little flowers and vintage styling, this little coat evokes the charm of those classic childrens books from the early twentieth century that celebrate the innocence, friendships and adventure of childhood. Narnia, Peter Pan, The Secret Garden, and A Little Princess still hold us in their thrall! In keeping with this inspiration, Rosebud is an adventurous knit, with many interesting features. 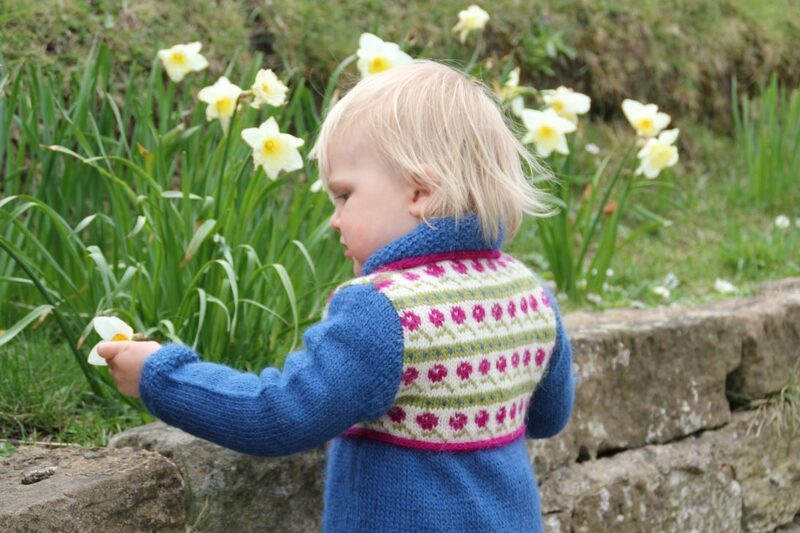 It is knitted from the bottom up in rounds, with steeks at the centre front and armholes. The sleeves are knitted from the top down, with short row shaping in the seleevecaps. Collar and fronts are edged with applied i-cord, incorporating i-cord buttonholes. 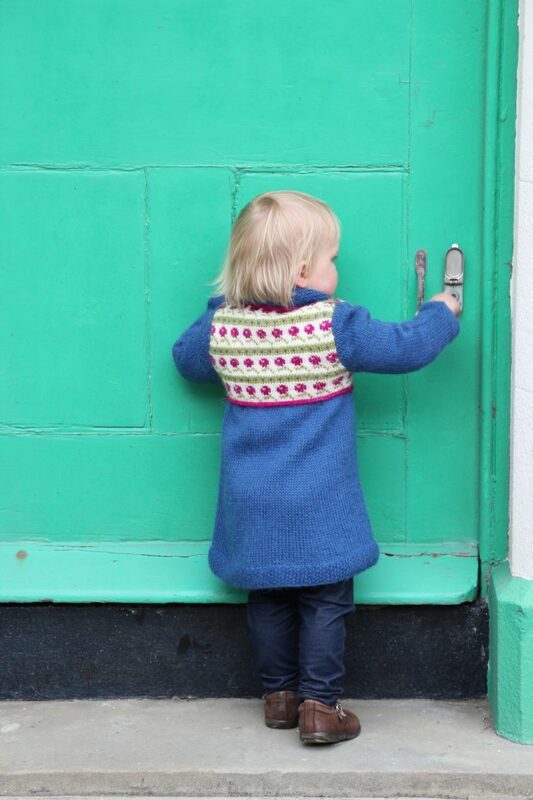 The pattern provides instruction for five sizes, for children from 1 to 5 years old. It includes a diagram with finished measurements in each size, and clearly illustrated tutorials for applied i-cord and i-cord buttonholes. Tension/gauge for the plain stocking stitch is 20 stitches and 24 rounds per 10cm/4″ after blocking. Tension/gauge for the stranded colourwork is 22 stitches and 25 rounds per 10cm/4″ after blocking. The suggested needle size is 4.5mm/US 8. In all sizes you will need 3 x 100g balls/skeins of the main colour, and 1 ball/skein each of 3 other colours in a light aran/worsted weight yarn with approximately 200 metres/220 yards per 100g. The pictured sample was knitted with Rowan ‘Creative Focus Worsted’ in the Delft, Magenta, Natural, and New Fern shades.